The conventional cruise ferry Norbank provides a host of onboard facilities to help make your journey a memorable one including delicious complimentary food, a spacious TV lounge, a bar, an onboard shop and comfortable cabins. Onboard the Norbank ferry you’ll find comfortable en-suite 2 bed cabins with a choice of either inside or outside (sea view). 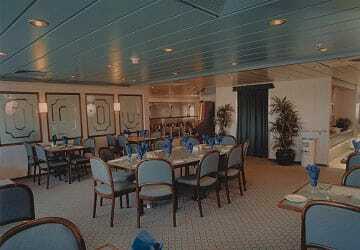 Meals are included in the price and complimentary tea, coffee and fruit juice are available throughout the crossing. The Norbank has a basic shop onboard. You can change currency onboard at the Bureau de Change. There are no lifts to the main passenger areas and access is by a staircase therefore the Norbank may be unsuitable for the infirm, disabled or young children. Please Note: Whilst we have taken great care in making our Norbank guide as accurate as possible, onboard facilities, services and entertainment may vary depending on the date and time of year that you travel, facilities mentioned may change without notification and ferry companies reserve the right to operate vessels other than those mentioned at time of booking without prior notification. "journeys on 10th and 24th September Liverpool / Dublin"
This was my first experience of Liverpool Dublin Liverpool route and found it to be a wonderful jouney on both occassions. Catering, Comfort, and Sleeping Arrangements all very good. Overall our experience as good however one major minus point is that although you say the ferry goes from "Liverpool Docks" this is not so, actually the sailing is from Bootle and you gave no postcode in your confirmation so we had to phone to find out where we should go to check in. Fortunately we had allowed enough time for error and were not late. Plus point - 'free' meals. "My trip to Ireland "
Just to say that we travelled with direct ferries it was a good crossing, the cabin was extremely clean, but sorry to say that l didn't enjoy the food, because it was like warm, and we was 3rd in queue and they had only just brought it out and opened up, that was also on the way back to. Also l found that some off the staff wasn't very helpful full and that they lacked customer service. I hadn't realised we would be fed twice and the food was more than adequate, with free hot and cold drinks available for the whole journey. All members of staff were pleasant and very helpful throughout the whole of the journey. 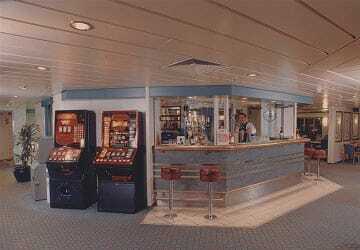 There was plenty to do with different areas including a TV rooms and a games room to enjoy during the crossing. We booked a cabin and the beds were very clean, comfy and the room had a showers. My only qualm would be that the duty free shop was small and had very limited stock. I will definitely travel using this company again. "Lovely staff and very nice crossing"
We enjoyed travelling with P&O because the boat was small but there was plenty of room and the cabin was very clean. We enjoyed the complimentary food too. Staff were lovely. We were served on the return journey at breakfast by a great steward who made us laugh and was so nice. Very family-friendly. Only gripe was no WiFi and only 2-pin sockets! "The fastes and and efficient service"
Fast and efficient service. Going club class provided comfortable pre-booked seat and free food and drink. The ferry was mainly for lorries so had limited facilities on board but the fare came with a free coffee, tea, juice, an evening meal and breakfast. The 2 berth cabin was 2 single beds not bunks so quite spacious, it was clean with shower and Toilet. On the whole it was ideal for a night crossing. Very polite staff. "A fascinating and repaxing way of crossing the Irish Sea"
Although a long crossing, this was a fascinating and relaxing way of crossing to Dublin and avoiding the drive to Holyhead. 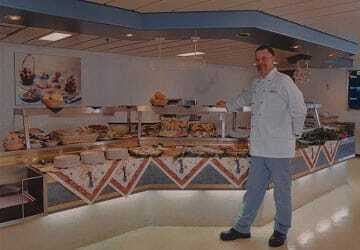 All food and drink was provided free, though after breakfast is served most of the crew have a kip before serving a meal in the last hour of the voyage. Self service hot drinks are provided at all times. There's plenty of space in the lounge and dinning area and for a little extra comfortable cabins are available. Take a good book there's not a lot else to do on board though. I can highly recommend Direct ferries. The staff were polite and helpful. The ships were clean and the facilities very good. The White bed linen in the cabins was spotless. Even the soap/ shower gel and towels are provided in your ensuite. The food is of a high standard and plentiful. We journeyed to and from Ireland and enjoyed a selection of salads, soups,full English breakfast, fish and chips and best of all was the delicious chicken and leek pie served piping hot on the Endeavour. The fact that free soft drinks and hot drinks are available throughout the day means that you do not need to take anything on board for your journey. It was our first time going from Liverpool to Dublin which is an 8 hours journey. We have all had a great time during the sail (including our 3 young boys). We were served two hot meals and staff were very friendly. On this route there are plenty of space in the ferry to sit or run around. 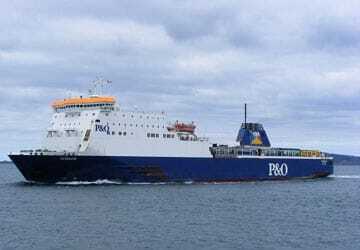 As this was our first ferry trip to Ireland we did not know what to expect but all was above expectectation from the directions to the Port of Liverpool to the outward bound portion. The first ferry was a bit small and overall not enough seating in the lounge but the food was excellent. The return trip was another matter the instructions on how to get to he required terminal where very poor to such an extent that we got lost in the port of Dublin and only found the correct terminal through the help of another ferry line?. If more succinct instructions from the M50 tunnel where given this would improve this problem. Overall it was a most enjoyable Ferry trip and very good value for money.. I shall recommend yourselves and P&O to my friends..